This past week was my first look at Google Glass. While it will definitely take some getting used to, and is most certainly not ready for prime time, I for one am very excited by its potential, particularly its potential to give us a glimpse into what a world with ubiquitous computing will look like. Ubiquitous computing at its core is about seamlessly embedding technology into everyday life. Let us consider two use situations in which doing this will make a world of difference. Check-in's: Foursquare introduced check-ins to the world in a fairly big way in 2009. Since then some of the webs biggest properties, including Facebook and Yelp, as well as numerous other competitors and services have tried to utilize check-ins in one form or another. However, Foursquare's growth began to slow down about 2.5 years ago. 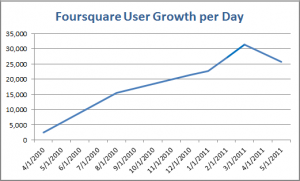 At the time the chart above was presented (May 2011), Foursquare had approximately 9M users. Since then, Foursquare's user acquisition per day has risen slightly to approximately 27.5K per day, but remains below the days of its peak user acquisition. Now one might make the argument that this is because of the proliferation of social networks, and the space having reached a state of maturity. However, I think that argument does not hold given that the social networks that emerged post-Foursquare, in particular Pinterest and Instagram, both surpassed the popularity of Foursquare. What's also interesting to note is that other popular check-in services, most notably those offered by Facebook (via. Places) and Yelp have not caught fire either. I think the reason behind this is the current user experience offered on mobile as it relates to check-ins. Unlike in the case of both Pinterest and Instagram, where the service simply provided a much more efficient means of doing something that people were already doing (i.e. creating collages and touching up images), check-in's, outside of the context of travel and dining in particular, are introducing new user behavior. Can user behavior be modified? Most definitely yes, but the technology has to make the entire process as seamless as possible - unfortunately with check-ins that is not the case, at least not yet. The process of having to take out your smart phone, update your status, and check into a place when starting something fun and interesting, is at best a novelty, and one that wears itself out unless its almost completely seamless. However the day is not too far off where check-ins are as smooth as speaking to something like Google glass, and saying "Check in to Yankee Stadium". When this happens, check-ins will go from being a novelty to being a part of everyday user behavior. Augmented Reality (AR): AR has been on the radar of most of us techies at least since 2008, however its applications in every day life are still very much a novelty. Interestingly the concept itself is not new, its been around for over a century, however there wasn't much movement on the AR front through most of the last century. In fact, simple applications of virtual reality (VR), AR's first cousin, seemed to have made much more headway than AR itself did through to the end of the last century. This might seem a bit counterintuitive given that VR requires the simulation of entire new worlds, vs. AR, which simply requires superimposing elements of the virtual world into the the real world. As is turns out, the latter is a more difficult problem to crack (unless of course you are trying to do something like full immersion virtual reality). This is because tracking real world objects in real time and interpreting them is a very complex problem, and requires some significant computing horsepower, which just wasn't available for every day use through most of the 20th century. Today of course the smart phone in our pocket has augmented reality capabilities. That said, outside of a few interesting applications of augmented reality, we have not seen any killer apps that leverage the technology. So why has augmented reality not taken off? Check-in's, for all its flaws mentioned in the previous section, are much more a norm for people to use than augmented reality. Why is this? Look no further than the image below! Walking around and looking at the world through your smart phones, does not just feel unnatural, it can be downright dangerous in its current form. Ubiquitous computing technologies like Google Glass change this entirely. The greatest promise of ubiquitous computing lies in its ability to match the service being offered with the medium that's most natural to deliver said service. For several augmented reality services, everything from obtaining directions while walking on a road to receiving a guided museum tour, eyewear like Google Glass is a much more appropriate medium to deliver the service than a smart phone is. Below is a short video released last week by Philips Healthcare and Accenture Technology Labs that does a great job of illustrating this point, and providing us with a glimpse into the world of ubiquitous computing. Enjoy! First healthcare wearable display proof of concept using Google Glass to send real time Philips Intellivue Solutions data.